These regional allies are among the 50 countries, including the United States, that have recognized him as president, not Mr. Maduro, who swore himself in in January for a second term after an election widely viewed as undemocratic. Article 231: The candidate elected shall take office as President of the Republic on January 10 of the first year of his constitutional term, by taking an oath before the National Assembly. If for any supervening reason, the person elected President of the Republic cannot be sworn in before the National Assembly, he shall take the oath of office before the Supreme Tribunal of Justice. The presidents of Bolivia, Cuba, El Salvador and Nicaragua did attend the ceremony, along with representatives from China, Mexico and Turkey. 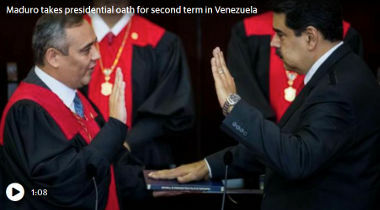 Maduro did not swear “himself in”, he was “sworn in”. He took the oath in front of the supreme court which is fully consistent with the constitution. (The National Assembly is held in contempt of a judgment by the supreme court and was therefore not eligible.) The Miami Herald has a short video of the scene. To cover for the non-legal way Random Guyaidó “swore himself in” the Times now alleges that President Maduro did similar. The difference in the wording seems minor, but it demonstrates the utter contempt for the constitution and laws that Guaidó and his supporters have shown. If Guaidó returns home only to be arrested, the opposition’s campaign — which has brought thousands of Venezuelans into the streets in recent weeks — could be stopped in its tracks. But if he remains abroad, the effort could also falter. There is a third way in which the opposition’s campaign might fail. It can simply be ignored. Just don’t look (vid) and the monsters will fail. “I’m heading home,” Guaido tweeted on Monday morning. In recent messages to his supporters, Guaido has appealed for huge demonstrations coinciding with his arrival as a way to pressure Maduro to resign. Workers set up a stage in a Caracas plaza where demonstrators plan to gather, and protests were planned elsewhere in the country. Q: Do you see any way to get rid of Maduro? Guaidó: I see many ways of getting rid of Maduro. He’s completely isolated, so much so that his only recourse is to continue to repress and use force against the people of Venezuela. The use of force is by paramilitary groups, it isn’t even the National Guard. Q: Is the army split? There were 200 defections from the military, but many officers have not defected. Guaidó: Two hundred is only a small portion. The vast majority of the armed forces, 80 percent, support me and reject the regime. It’s just the top people who continue to hold on. There is a lot of fear, because of the types of tactics that they’re using. Bolton may have hoped that Guaidó would be arrested. If that was his plan it failed. But such tweets have an effect. They demonstrate that Guaidó is a U.S. puppet and that does not increase that persons support. At least not in Latin America. BOLTON: [..] I think since most of my tweets also come out in Spanish, because we want to reach the Latin American audience in particular, that a lot of people, especially on the political left, in the hemisphere and around the world, now understand that the failed experiment of Hugo Chavez and Nicolas Maduro needs to end. So, I would like to see as broad a coalition as we can put together to replace Maduro, to replace the whole corrupt regime. That’s what we’re trying to do. TAPPER: But do you not see that the United States’ support for other brutal dictators around the world undermines the credibility of the argument you’re making? BOLTON: No, I don’t think it does. I think it’s separate. And I think, look, in this administration, we’re not afraid to use the phrase Monroe Doctrine. This is a country in our hemisphere. It’s been the objective of American presidents going back to Ronald Reagan to have a completely democratic hemisphere. I mentioned back in — at the end of last year that we’re looking very much at the troika of tyranny, including Cuba, Nicaragua, as well as Maduro. Part of the problem in Venezuela is the heavy Cuban presence, 20,000 to 25,000 Cuban security officials, by reports that have been in the public. This is the sort of thing that we find unacceptable. And that’s why we’re pursuing these policies. There are some 20,000 Cuban doctors working in Venezuela. I find no report that any Cuban security officials have appeared there. By mentioning Reagan and the two hundred years old Monroe Doctrine, Bolton makes sure that neither the political left nor the right in the Americas will support any action the U.S. is going to take. The people there know what the U.S. has done to them throughout the centuries and they will oppose any future intervention. That Bolton openly threatens to continue that imperial behavior makes it more difficult for other countries to support it. Maduro does not appear to be widely liked, but he is certainly more popular than the widely reviled and mocked Juan Guaido, President Donald Trump’s toy poodle. Maduro can sit this out. Guaidó’s claims to the presidency are clearly illegal. He has failed to gain support at every step of his way. The army stands strongly behind the government. No human waves appeared to carry the ‘humanitarian aid’ across the border. The opposition does not know what to do next. All neighboring countries spoke out against a military intervention. Russia and China will prevent negative steps at the UN. While the U.S. wages an economic siege against the country, others are willing to help. Sanctions alone hardly ever bring a government down. Maduro can simply let Guaidó clown around in Caracas or wherever he wants to go. The guy seems unable to deliver results. The longer his campaign takes the less support will he have. In a few month the whole thing may well fizzle out. What will Bolton do when he finally recognizes that fact?